“What took you so long?”, you may ask. “Wiha PicoFinish 267 P“, a set of Torx No. 4,5,6,7,8,9 and some other (older) Wiha and Gebra screwdrivers (1) that made me switch from the Chinese crap as pictured above (2). 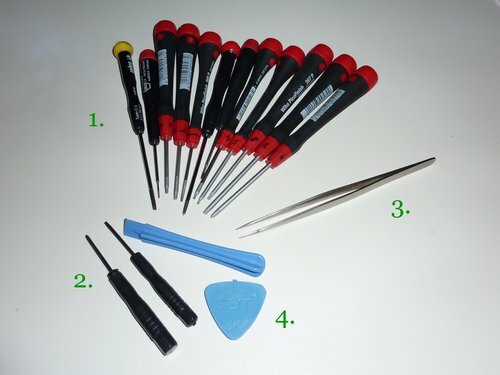 The Chinese alternative aka short & black Torx screwdrivers…well, they work and for the occassional repair job they are just fine (I’ve been using mine since ~ 2001; I have a lot of these cheap Torx No. 5, 6, 7), BUT! these Wiha screwdrivers are just so much more comfortable and also FIT the screws without any quality issues. Working with good tools just pays off – I could name endless occasions when I killed a screw just because of bad tools. Stupid me! And it’s just 20 EUR. Sure, a lot of money for srewdrivers that I already had. It’s just after buying a Phillips-head screwdriver from Wiha for another project when I realized that I’d been wasting my life with bad tools so far. Another reason for this blog post are the pair of tweezers as pictured above (3). It’s just amazing how much you can fix with these tweezers. Just the other day I read about a gourmet chef who cooks with a pair of tweezers (!) and I can only assure you that it makes a lot of sense. But also anyone trying to fix Apple products needs such tweezers. They are just as indispensable as the plastic opening tools (4). Never use cheap or damaged tools, and never misuse them for other purposes than what they are made for.